Wood Prairie Co-Worker Mary Green Needs Our Help. Special Offer: FREE Organic Adirondack Red Seed Potatoes. Biological Trident Now Approved for Organic Control of Colorado Potato Beetles. Notable Quote: Douglass on Injustice. This edition of the Seed Piece may be found in our Wood Prairie Seed Piece Archives. 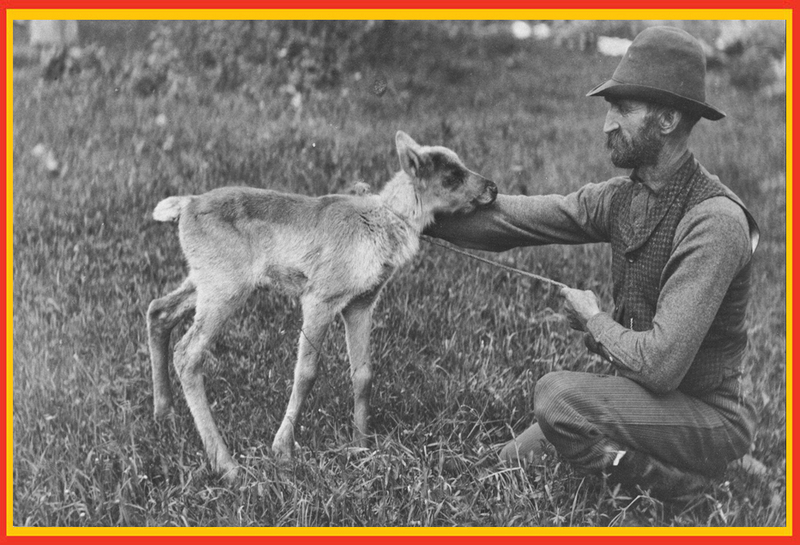 Three-Week-Old Baby Caribou, Aroostook County, Maine. Circa 1893. We see plenty of moose and deer on our farm, and the occasional bear, but the last Caribou in Northern Maine were killed a century ago. The past weeks have been consistently gray and dreary with plenty of rain. The wood stove has been running more on than off. Today, for a change, it was sunny and warm (in the 60s) and more of that is the forecast for tomorrow. Then the rain returns again on Sunday morning. Today, Caleb hooked up our 19-foot Vibrashank harrow to our 92 HP Oliver Diesel tractor, and mounted the dual wheels onto the tractor. Our plan for tomorrow evening is to try and do shallow harrowing on all of our open ground in an effort to 'break the crust' and arrest weed growth. While the weather pattern could change next week, so far we're off to a wet spring here in Maine. Breaking the crust will help the sun and wind further dry out the ground. In time, drying ground will allow us to start planting crops of seed grain and seed potatoes. Click here for the Wood Prairie Family Farm Home Page. Wood Prairie's Mary Green. Surrounded by daughters Michelle (l.) and Chelsea (r.). If you have ever called Wood Prairie Family Farm - with a question or to place an order - more likely than not, you have spoken to Mary Green. Mary is our primary on answering the office phone in her role as our Office Manager. Mary is Megan’s right hand woman. The two of them work shoulder-to-shoulder organizing and pushing out many, many thousands of organic orders every year. 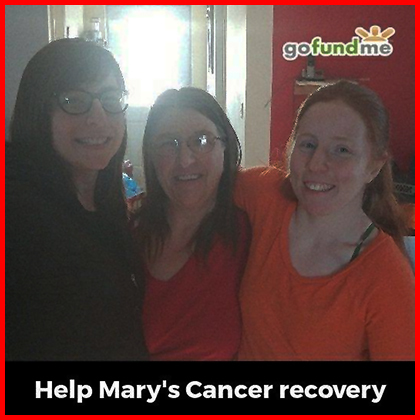 Mary is now waging a battle against cancer and she needs our help. Her daughters have set up a Go Fund Me crowd funding site where our donations may be sent. Mary and her family need help with a wide array of needs from mortgage to transportation. She is receiving treatment in Boston, one of the more expensive cities anywhere in the country. The Greens and the Gerritsens are two very close families. We can assure you these are the best people in the world and their need for help is genuine and immediate. Three of the home-schooled Greens have worked here a lot over the years since they were kids. Chelsea was the champ and worked here eight consecutive years until last Fall when she left to marry Justin - another Wood Prairie co-worker - and they moved to their new home in rural southern Maine. Please join us today in donating via the Green’s Go Fund Me campaign to help with major expenses ahead. Even small amounts do add up and every dollar we give is gratefully appreciated! If you can't give right now, one way you can help is by sharing the Green’s Go Fund Me campaign on your social networks. Thanks so much! One of the prettier potatoes we dig from our field is the Cornell University variety, Adirondack Red. It has a beautiful dark red, smooth skin and shallow eyes. The flesh is a strong pink with a pleasing moist texture. Here’s your chance to earn some FREE Organic Adirondack Red Seed Potatoes. Receive a FREE 1 Lb. sack of our Organic Adirondack Red Seed Potatoes (Value $11.95) when your next order totals $39 or more. FREE Organic Adirondack Red Seed Potato Offer ends 11:59 PM on Monday, May 15, 2017, so better act now. Please use Promo Code WPFF409. Your order and FREE Organic Adirondack Red Seed Potatoes must ship by May 26, 2017. Offer may not be combined with other offers. Please call or click today! Organic Adirondack Red. Prime ingredient in Red, White and Blue Potato Salad..
Trident is OMRI-Listed. Trident passed this big hurdle and may now be used - with permission - by Certified Organic Farmers. Biological Trident Now Approved for Organic Control of Colorado Potato Beetles. As reported in our March 24 issue of the Wood Prairie Seed Piece, biological insecticide Trident was given listing by the Organic Materials Review Institute (“OMRI-Listing”). This means that once a Certified Organic farmer receives prior approval from their organic certifier, Trident can be used as one technique for controlling the notorious Colorado Potato Beetle, one of the top four most destructive agricultural pests worldwide. Additionally, individual States require registration of these sorts of materials within their boundaries prior to usage. We have now received confirmation that the registration process has been completed in both the States of Maine and Vermont. Registration filing has been made in New Hampshire and registration is pending. No doubt additional States have also already come on Board and registered Trident for use. Trident is a type of Bacillus thuringiensis and has low ecological profile. It has been many years since we have used this product, but given our past positive experience, it is is likely to now become an important tool for managing CPBs on Wood Prairie Family Farm. Manufacturer Certis USA says it is going through the registration process in 27 States where potatoes are widely grown. If you are not able to find a source for Trident, put in a call to Certis USA and ask them where it may be obtained. Notable Quotes: Frederick Douglass on Injustice. Combine the butter, flour, dry mustard, and salt in the bowl of a stand mixer. Mix on low speed with the paddle attachment until the mixture is crumbly and the butter starts to integrate into the mixture, about 30 seconds. Add the cheese and mix again on low speed for a few seconds. In a measuring cup, combine 3/4 c water, the vinegar, and the ice cube and let sit for a moment to get cold. Add 6 T of the vinegar mixture to the dough and mix on medium speed for 20 seconds. Continue to add liquid, 1 T at a time, until the dough clings in a ball to the beater. Mix for an additional 30 seconds. Wrap the dough in plastic wrap and refrigerate for at least two hours, and up to 3 days. Remove the dough from the refrigerator 15 minutes before rolling out. Preheat oven to 325F and grease two baking sheets. Turn dough onto a lightly floured surface and roll out until dough is 1/8" thick. Cut into desired shapes using knife or cutter. Bake 1" apart on sheets for 18-25 minutes, depending on thickness of crackers. 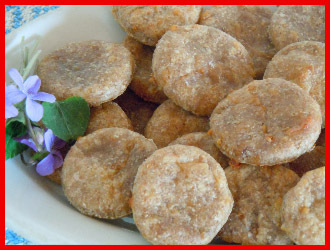 Turn off oven, prop open the oven door and allow crackers to crisp as the oven cools, - at least twenty minutes. Organic Reddale Potatoes In Blossom On Wood Prairie Family Farm. Early and Reliable red-skinned variety.